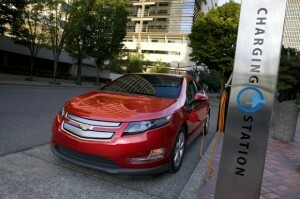 This week GE announced plans to purchase 25,000 electric cars by 2015. According to GreenBeat, this is the largest purchase in the history of electric vehicles. The purchases will be for its own fleet and for its Capital Fleet Services business, where customers can lease electric cars through GE. GE plans to convert over 50 percent of its massive global fleet (over 10,000 fleet vehicles) and purchase 12,000 electric cars from GM. Fleet sales are predicted to be a key part of electric vehicle adoption. According to BusinessWeek, gigantic orders like this could do a lot to push electric vehicle prices down and speed up adoption. “By electrifying our own fleet, we will accelerate the adoption curve, drive scale, and move electric vehicles from anticipation to action,” CEO Jeffrey Immelt said in a company statement. GM does big business in fleet sales. Corporate fleets make a lot of sense because of their sheer volume. Plus GE fleet sales are quite profitable. The company has a big incentive to invest in the electric vehicle market. GE makes the WattStation electric vehicle charger. GE estimates it will reap $500 million in near-term revenues from electric vehicle infrastructure alone. One of the most popular green fleet vehicles is the GE Volt, an electric vehicle that shifts to gas power after going 25 to 50 miles on its battery, so drivers aren’t entirely dependent on the battery. Despite GE’s participation in the market, electric vehicles still face a long road to adoption. One recent report forecast that electric and hybrid vehicles combined would only account for seven percent of passenger vehicle sales by 2020. There are issues such as serious consumer education barriers, plus lingering issues about battery lifetime and the higher cost of the car. For fleets that don’t have the money to invest in electric or hybrid vehicles, try FieldLogix – a Green Fleet Tracking & GPS Fleet Management System. FieldLogix reduces operating costs and vehicle emissions which is a win-win for the bottom line and the environment.